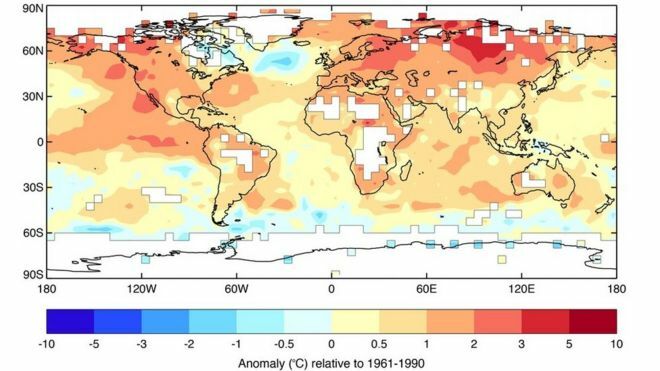 Global temperatures in 2015 were the warmest on record, according to data published by meteorologists in the UK and US. The Met Office figures show that 2015 was 0.75C warmer than the long-term average between 1961-1990. US data suggests that 2015 “shattered” the temperature record by the widest margin ever recorded. Thanks for sharing, Cyril. How much more hotter do we have to get before we get serious about ending our addiction to fossil fuels? Climate change is real, obviously. What isn’t as clear is, how much of that is due to natural cyclic climate change, how much to man-made pollution? If due to use of fossil fuels, we should break it down to finger the greatest abusers. Why are the war-makers left off the hook? How much is war contributing to the problem, and shouldn’t that be the first thing to end, since it requires nothing to take its place? To my knowledge, peace does not use fossil fuels, so it could be implemented without the costs of supplying alternatives. Then we could move on to other industries, while remembering that drastic change can hurt as much, or more, than it heals. Generations have developed using fossil fuels; entire cities are designed around the use of such fuels. Yes, alternatives may have been available, and such alternatives may be able to replace and eradicate the use of oil and gas, hydro and nuclear power generation to fuel man’s growing cities, industries and addiction to travel, but who is going to bear the real cost of making these changes? Who is going to be taxed (literally and figuratively) to pay; who’s going to pay the “green tax” and the “carbon tax” and all those whopping “environmental” taxes thought up by a totalitarian bureaucracy responsible only to its masters at the very top of the food chain? Who’s going to be even more marginalized than they are already with a new technology requiring them to make drastic changes to their living/transport situation? It will be, as always, those who can least afford them. All of the world’s nations are in debt to their eyeballs to fake economies run by banksters. Who is going to first put them out of business, and re-direct all funding from a warless and bankless society into alternative sources of energy? It’s the old rotten apples in the box: you can’t keep your apples from continuing to rot if you leave some rotten ones in the bottom. This world is pandemically infected by greedy, violent, avaricious psychopathic leadership. If that isn’t dealt with before any new energy sources are developed enough to replace the old, you can be sure that your “new” ways will also go bad: it’s inevitable. With Dickensian injustice high-handedly ruling this world nothing good can be accomplished under such rule. Pollution isn’t the cause of injustice, injustice is the real cause behind pollution. So, do we deal with the cause, or the symptom only?